Hope’s first wife was his vaudeville partner Grace Louise Troxell, whom he married on January 25, 1933. Hope denied that the marriage had any substance and said they had quickly divorced. There were rumors that he fathered a daughter with Troxell and that he continued to send generous checks to her despite a widely documented reputation for frugality. 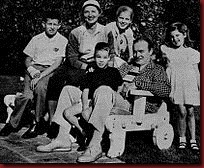 In 1934, Bob Hope married Dolores (DeFina) Reade, and adopted four children at The Cradle in Evanston, Illinois: Linda, Tony, Kelly and Nora. From them he had several grandchildren, including Andrew, Miranda, and Zachary Hope. Tony (Anthony J. Hope), who served as a presidential appointee in the George H.W. Bush and Clinton administrations and in a variety of posts under Presidents Ford and Reagan. Thank you for stopping by my blog and for the like. Blessings of the day to you! Interesting. I liked his movies. Always a sweet personna. I saw him in Palm Springs when I was there on Spring break ministering as a college kid with Van Nuys Baptist.